After some prompting, Julian Calder in the London office of Fraser Yachts confirms that he and his colleague Nabil El Jammal have signed the new 31m sailing yacht Shadow for sale. Launched just two months ago by Comar Yachts as the yard's flagship, Shadow is the first Super Maxi Yacht built by the yard. Design is by Giulietto Ricci, Andrea Valicelli and Alessandro Nazareth. The lines of the hull and deck are those of a fast cruiser. While limiting displacement, the yacht offers ample interior room. The design is optimized to ensure maximum comfort even when sailing on a close haul. Shadow was well received at last week's Monaco Yacht Show and was also in Porto Cervo for the Maxi Rolex Cup where she did not compete but shadowed the fleet, achieving a speed of 16.5 knots. 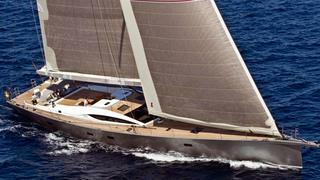 Shadow will also be available to view at the upcoming Genoa Show and is asking €8.9 million.